Here is a recent test we did with some of the two part fillers available from Upol who are a global company dedicated to the manufacture of automotive refinishing products including body fillers, coatings, aerosols, polishing compounds and consumables of the highest quality. 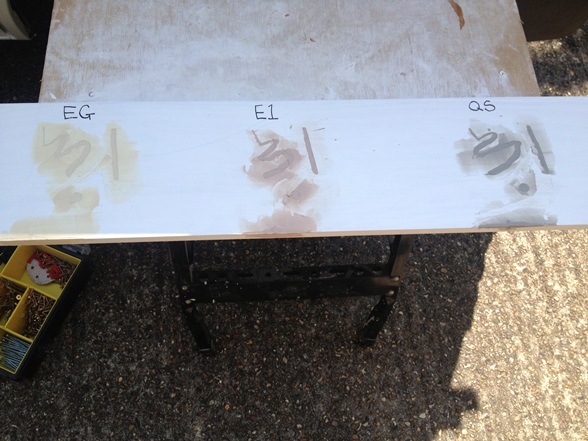 With their products primarily aimed at the automotive refinishing/repair market many of their products are irrelevant (to an extent) to the painting and decorating industry. However, their body fillers are held in high regard amongst many professional painters and decorators as the number one solution for filling holes and imperfections on a variety of timber surfaces. 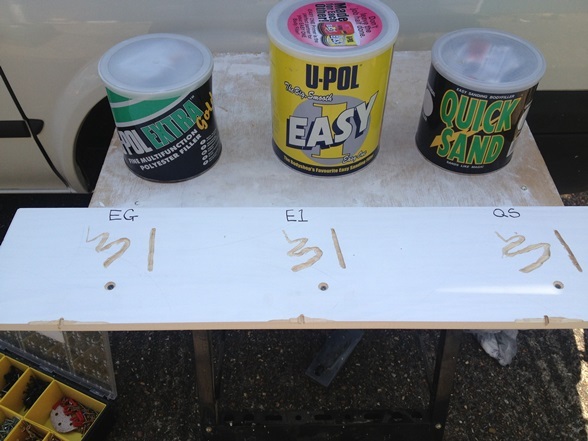 The fillers used for this test were Upol Easy One, Upol Extra Gold and Upol Quick Sand. 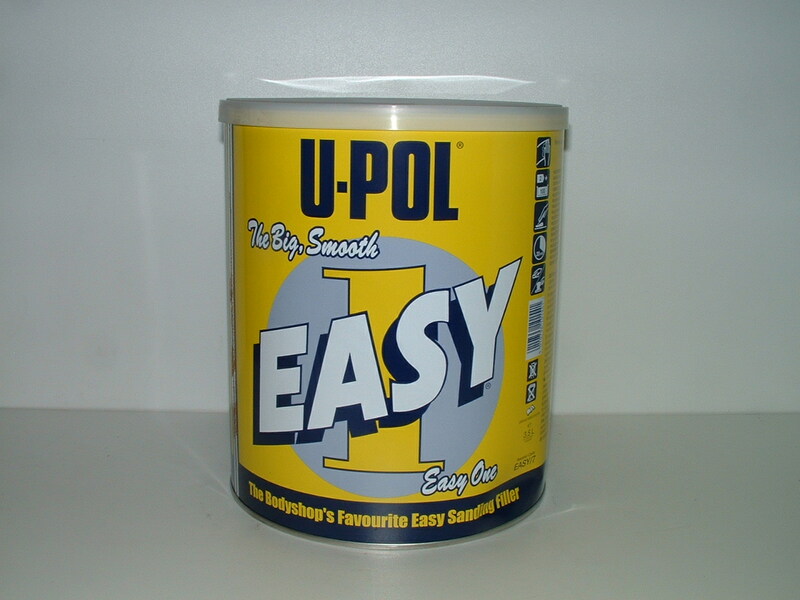 Other fillers are available including regular Upol Extra, Flyweight, Isopon P38, Smooth 7, Easylite and another called Fantastic. I have no experience with most but Fantastic I use often, it is very lightweight and spreads exceptionally well which means it is perfect for ‘facing off’ window boards and broader surfaces that need a lot of shallow filling. 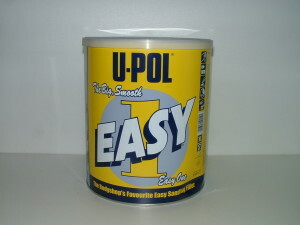 Over the next few months I will try to redo the tests with some of the lesser known/used fillers available from Upol. For the experiment I used a pine shelf secured to a workbench. I used a router tool to carve a deep gouge, a progressively deepening zigzag shape, countersunk a screw and carved off the edge of the shelf. 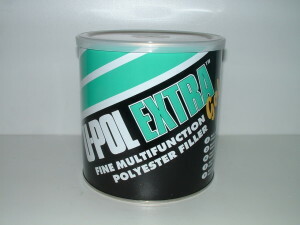 This pattern was repeated three times across the shelf to provide one set of tests for each filler. Although unlikely to encounter holes as demanding as the zigzag, it was definitely a good test of what each filler could achieve when really pushed to the limit, in honesty something as deep as the gouges I would normally have used Repair Care. The straight deep gouge is also above and beyond what you would expect to encounter in an everyday painting and decorating situation but hey, it’s a test! So let’s test! A countersunk screw is something I would imagine almost every professional painter and decorator has come across, so I would expect any decent filler to be able to take care of this with no problems. 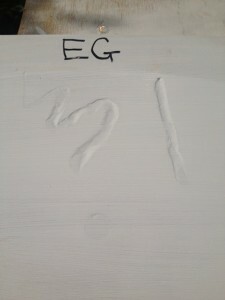 The bitten edge of the shelf is also a common type of fill for most decorators, but is a good test for ‘slump’. So with the first fill applied, what is noteworthy about them? Well, the first thing to notice about the Extra Gold (EG) is the overpowering smell! Way more smelly than the Easy One (E1) that I normally use. I found EG to have a working time of around 7 minutes, it has a very stiff consistency making it easy to manipulate into the awkward zigzag shape and also easy to build up the edge fill without any slump. 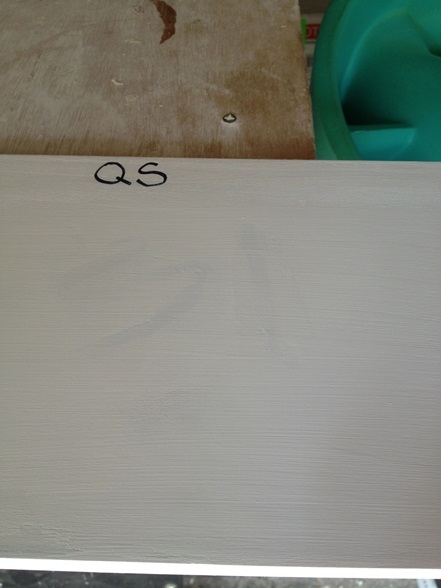 I was able to rub down the test fills in 49 seconds using Abranet abrasives. Unfortunately the first fill sunk terribly, presumably from being pulled into the pores of the timber. 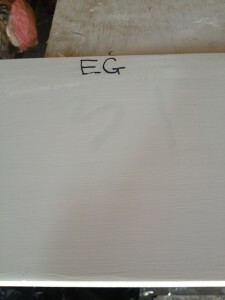 At this point I thought that EG was only really suitable for metal surfaces. No surprise with Easy One (E1) as it’s my regular go-to two part filler. A nice smooth consistency much gummier than EG. I’ve always found it to be easy to use and reliable. 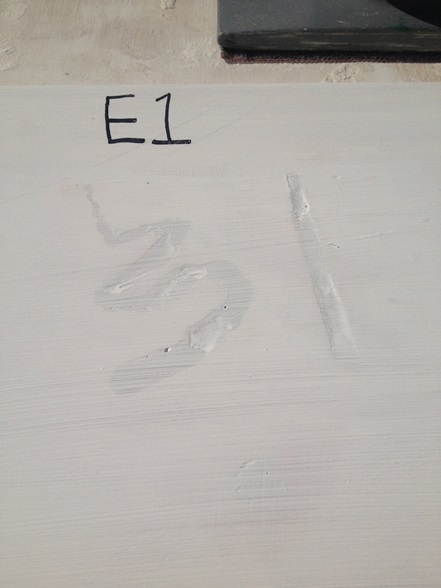 E1 has a working time of around 5 minutes and took a bit less effort to rub down with Abranet abrasives at 32 seconds. Far less shrinkage than EG but clearly a second fill is required. 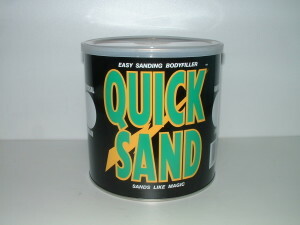 Then onto the Quick Sand (QS), again this had a more pungent smell than E1 but nowhere near as smelly as EG. 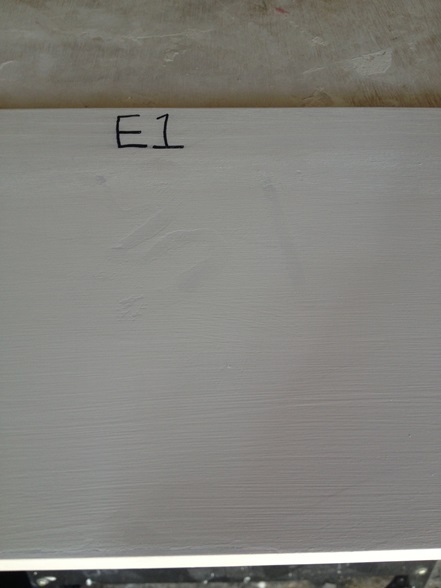 The consistency is finer than E1, somewhere in between Fantastic and E1, making it very easy to spread but caused a bit of sagging on the edge fill. It has a working time of around 7 minutes but I was able to rub it down in a VERY impressive 23 seconds, less than half that of EG. Again it is obvious that a second fill is required but, bearing in mind that it is fairly lightweight compared to the others, the shrinkage was minimal. 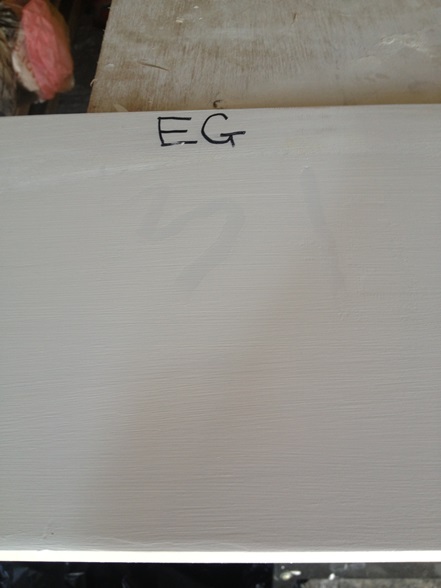 Then onto the second fill, starting at the beginning with the EG. After the first fill I had thought that this would be a pointless exercise and maybe it wasn’t suitable for filling imperfections in timber, but EG had excellent results from the second fill. Apart from being able to see the different colour through the primer it was invisible, perfectly flush with the rest of the surface on the zigzag, gouge and screw hole. Also fair results on the edge fill. 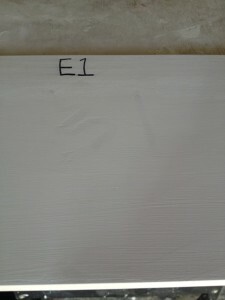 Next in line was the E1, which had poor results on the zigzag. 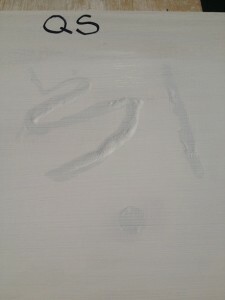 Unfortunately the filler did not adhere to the primer properly and the thinner areas came away when rubbing down. A third fill would have been needed to totally hide the imperfections. However it did have excellent results with the countersunk screw and the bitten edge. 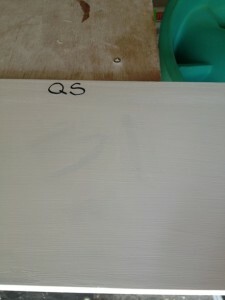 And lastly the QS, very good results on the zigzag, gouges and screw. Not so great on the edge fill though, because it doesn’t a consistency as stiff as the other two it did slump slightly. Don’t get me wrong, it did the job, but left a slight dip. Overall, I think that the Upol Quick Sand came out on top and performed the best for the most part of the test. 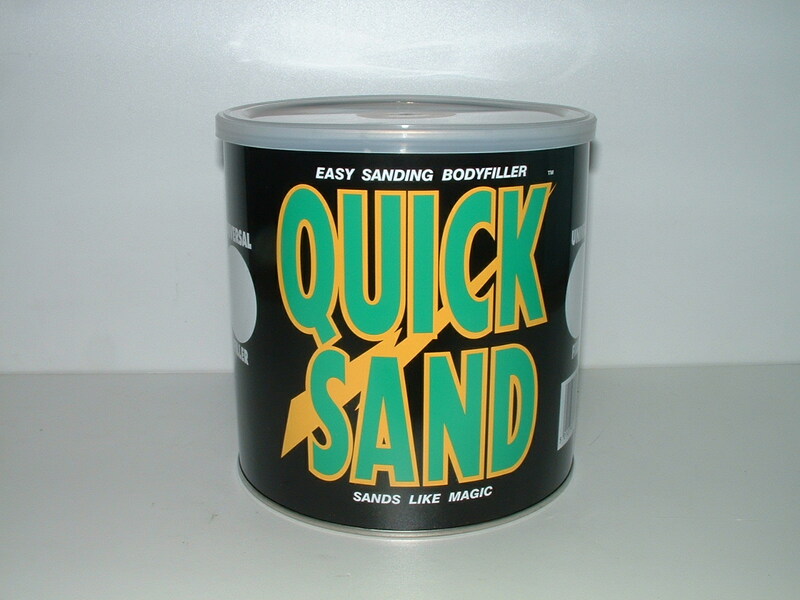 Also the lightning fast sanding (as the name suggests) cannot be ignored! If you found this article useful you can subscribe to our blog here.